Plan – Decide the company information such as staff and functions (departments) that will be made accessible to callers. High-Level Design – Organize the plan in a Table that identifies Extensions, Messages, API Goals, and Transfer-To-Number. This will give an overall picture of your plan. Recordings – Script your recordings and then make the recordings. Setup – Steps to setup the Auto-Attendant for the Inbound number and each Extension. Test & Verify – Make sure your plan operates as you intend and is easy to understand for callers. It is important to think about what kind of information your callers need, what a receptionist would typically do when receiving calls, and how to categorize and automate the receptionist function. As part of your plan, each Auto-Attendant Extension must cause one or more of these actions when it is selected: play a message, trigger an API Goal, and/or transfer the call to another number. Consider the following questions to help lay out an Auto-Attendant plan. What Extensions do you want? Make a list with the name or purpose of each Extension. This will tell how many Extensions you will have. This should be a fairly short list, because callers don’t want to listen to a long Greeting. Will there be a message played for each extension? A message can be used to confirm the caller’s selection. Do you need to trigger an API goal for an Extension? It will not be common to do this. One reason to trigger an API goal is to track specific kinds of calls. 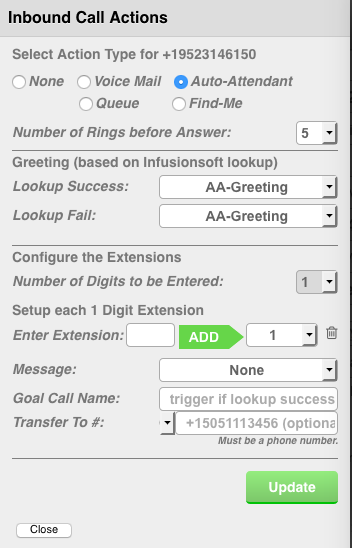 Remember – an API goal can only be triggered if an Infusionsoft Contact Record exists for the caller. For each Extension, should the call be transferred? In most cases, you will provide a Transfer-To number. This can be any valid phone number. The Transfer-To number can have Voicemail or any other allowed features, and if it is a turboDial Inbound number then it can have its own Auto-Attendant. You should acquire any Inbound numbers that you don’t already have. Extension number. These may be 1-4 digits in length, and do not need to be sequential. Message Name. We use a convention of starting each Extension’s Message name with AA (for Auto-Attendant) and then a descriptive name. This is done because the recorded messages for Auto-Attendant reside in the Recorded Message list with other messages, and this way they will be grouped together. API Goal. This name must be the same as the Infusionsoft API Goal Call Name. Transfer-To #. Any valid phone number can be used. This table is provided with blanks for you to fill in as you design your Auto-Attendant at turboDial Auto-Attendant Template. You may find it useful to keep this table available for reference, or if your Auto-Attendant design needs to change. In this design, choosing Extension 1 plays the recording that states your business Hours and then the call is terminated, so there is no need for a Transfer-To #. Extension 2 does not have a message, and the call is transferred to the designated number. This design shows how one person may perform multiple functions, and so the Transfer-To number is the same for two different extensions, as shown above for extension 0 and 3 where the phone number is the same for both Receptionist and Sales Agents. Extension 4 is a temporary Inbound number for the duration of the Spring Sale promotion. The API goal can be used to add a tag to contact records to enable report production. This step involves writing scripts for your Greetings and Messages, and Recording them. The next step is to create scripts that can be read out loud while recording your Auto-Attendant Greetings and messages. You will find that reading your scripts will produce a better result than trying to remember what you want to say while recording. The Greeting is a pre-recorded message associated with the Inbound number and usually provides information about the Extensions they may choose from. You may have two Greeting messages – one for known callers who have a Contact record in Infusionsoft, and you may also have a different recorded message for unknown callers. Each Extension may have an optional pre-recorded Message that confirms the choice they made and may provide additional information. The following are example scripts. Thank you for calling ACME Sales. Please press 1 for our Hours. Press 2 to place an order. Press 3 to speak with one of our sales agents. Press 4 for information on our Spring Sale. For all other calls, please press 0 and you will be connected with our Receptionist. You will now be transferred to the Receptionist. Our business hours are Monday through Friday, from 8:00 AM to 5:00 PM Central Standard Time. You will now be transferred to one of our Agents. You will now be transferred to one of our Agents who can tell you about our Spring Sale. You have done the planning, design and recording preparation for the Auto-Attendant and are now ready to implement the plan in turboDial. This section will walk through the Auto-Attendant Setup screens. As we go through this, it will be helpful to refer to the Auto-Attendant Dial Plan Table from the example design above. Choose and Configure an Inbound Number – In this example, we are using the number +19523146150, which has already been acquired in turboDial. On the right side of the turboDial panel – Inbound & SMS, click on the red pencil. C. Choose the number of rings. In this example, we chose 3. D. Choose the recorded message labeled “AA-Greeting” for both Greetings. E. Choose the number of digits to be dialed for an Extension, 1-4. For this example, we choose 1. 1. 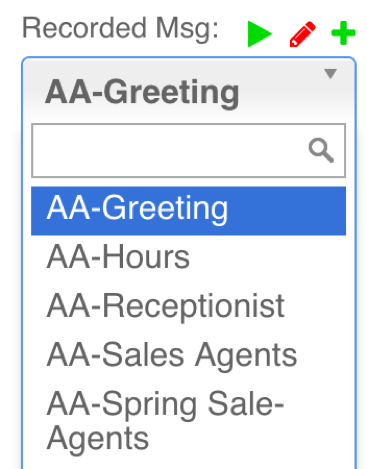 For the Message, choose “AA-Receptionist”. 2. Do not set Goal Call Name. 3. Set Transfer-To # to: +19522223340. 2. For the Message, choose “AA-Hours”. 3. Do not set Goal Call Name. 4. Do not set Transfer-To #. The following shows a screenshot of this setup. 2. Do not choose a message. 4. Set Transfer-To # to: +19527772701. 2. For the Message, choose “AA-Sales Agents”. 4. Set Transfer-To # to: +19522223340. 2. For Message choose “AA-Spring Sale-Agents”. 3. Set Goal Call Name to “TrackSpringSale”. 4. Set Transfer-To # to: +19522223845. G. We are now finished setting up the Auto-Attendant for the Inbound number, so we can click Update to save the setup. We recommend testing this by making calls to the Inbound number and choosing each Extension in turn, to verify that your design operates as you planned and is easy for the caller to navigate.